Now there is a special Star Trek figurine made by Precious Moments. 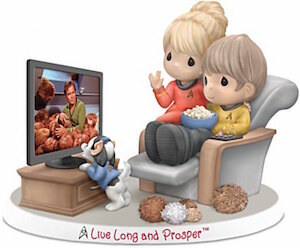 This is a porcelain figurine that shows two Star Trek fans all dress up in Star Trek attire when they watch Star Trek on TV and yes even the dog is enjoying show and the animal is dressed up like Spock. 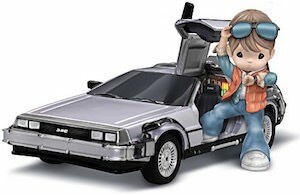 It’s an amazing detailed figurine that is also super cute. On the base of the Star Trek figurine it says “Live Long And Prosper” as that is something every fan knows. You know that if you are a true collector of figurines and Star Trek memorabilia that this figurine can’t be missing in your collection so make sure you don’t wait to long before ordering. This is the cutest Tin Man that I ever seen. This Wizard Of Oz figurine is made by Precious Moments and that of course means a quality hightly detailed product that make people stare and admire. This Tin Man figurine is called “Let Your Heart Guide You” and is made from Bisque porcelain. 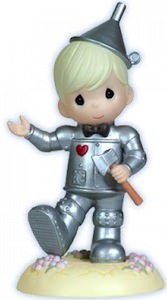 As you can see on the picture Tin Man is wearing his tin suit with his little axe and he even has a little bow tie and of course a red heart. This Tin Man figurine has such amazing details that it almost looks like it walked right out of The Wizard of Oz story. If you collect amazing figurines then you have to get this Precious Moments Tin Man Figurine. This is a amazingly detailed Bambi figurine made by Precious Moments and it’s called “A Friend Helps You Get Back On Your Feet”. Based on the famous scene when Bambi keeps sliding on the ice not knowing what is happening and then she gets back on her feet with Thumper’s help. This figurine is 3 1/4″ high and made from bisque porcelain/glass and will last a life time. A Bambi figurine is just a must have as these animals are so cute to watch. 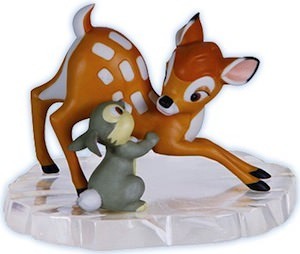 Come and have a better look at this Bambi And Thumper Precious Moments Figurine.